Lose the flashcards and pick up your iPad because teaching children how to form sentences is as easy as clicking on an app! Language Builder, winner of the 3rd Best Educational App of 2011 by both AppsForHomeschooling.com and 9th Best Educational App of 2011 by SmartAppsForKids.com, assists children in developing sentences which are age-appropriate in length and grammatically correct. With its use of real-life photos and the ability to record and track student progress, this app certainly is worthy of its place at the top of many educational app lists! Continue reading for my review on this application! A male narrator first greets you stating, “Welcome back to Language Builder”. Then, the Settings page is shown in portrait format with the last students’ name to use the application as well as various settings you can choose based on a students’ level of cognition, language skills, age, and grade. If you look at the bottom of the screen, you will find four different tabs with an icon for each. The Info tab (with an icon of a lower case “i” with a circle around it), when pressed, brings you to the developers’ information about the application as well as their interpretation of how the application should be used. 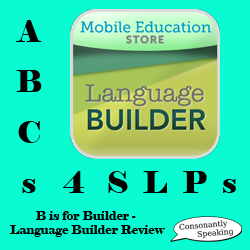 The Mobile Education Store states that Language Builder is designed to “build receptive and expressive language skills”. The Settings tab (with an icon of a file cabinet), when pressed, shows you choices for various settings in the application. It allows you to type the students’ name, select the level of hints, and choose whether or not you would like to show the hint button when playing. 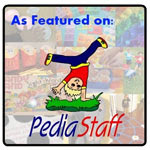 The Play tab (with an icon of a running man), opens the language building activity itself. More detail on each of these tabs will follow. Finally, the Archive tab (with an icon of a floppy disk) shows saved audio files from a students’ previous saved audio recorded sentences. When you click on the box underneath the label “Student Name”, the keyboard will appear at the bottom of the iPad. You can then type the students’ name into this box, and it will carry over to the Archive tab. On the iPod Touch/iPhone, only one student may be entered at a time. On the iPad, multiple names can be stored in the application, and you must select which student is the one who is currently playing in order for him or her to be scored. Once a name is chosen, the name will carry over to the Archive tab with the data remaining the same until you press the “Reset Stats” button. A slide switch allows you to choose whether or not you would like your student to have the ability to receive hints or not. If this button is toggled in the “On” position, a hint button will appear during play for each picture. Once it is pressed, a text or audio hint will appear depending on what level of hint you have selected. If this switch is in the “Off” position, the hint button will not be present and textual/verbal hints will not be offered. To move the button between the “On” and “Off” positions, press and slide it left or right. This option is called “Hints” on the iPod Touch/iPhone. Prior to each sentence, a male child’s voice states “make a sentence about the picture”. If this is too repetitive for your students, on the iPad you have the option to turn this statement off by sliding the button“On” or “Off” next to the text “Audio Instruction”. Level 1: A text example of a sentence will appear at the top of the screen with a few missing words for the student to fill in. Level 2: A text example of the beginning of a sentence will appear at the top of the screen. This text will only consist of a few words. Level 3: An audio clip will be played with no text accompanying the picture. This audio will state a couple words that the student may want to include in his or her sentence. If you have purchased one or more of these image packs and would like to have your student play on one of them, you must click on the module in which you want them to play. A check mark will appear next to the module chosen. If you accidentally reset your iPod or iPad, or lose data, you can click the “Restore Previous Purchases” button on the Settings page. On the iPod Touch/iPhone, this option is called “Available Themes”. There are 50 images included in the application with a possibility of up to 250 additional images with expansion modules. The setting “Randomize All Themes” has an on-off toggle switch. Slide it to the left or right to randomize various image themes within the app or not. The application play for this app is the easiest of all of the Mobile Education Store apps in my opinion. This is because the maximum amount of buttons at any time on the screen is three and there are no text or audio cues unless you have chosen that hint level on the Settings page. Each image page is nice and clean and crisp with real-life photos. If you have some of the other Mobile Education Store apps, you may notice some similar images to the other apps. Once you click the "Play" tab at the bottom of the screen, an image will appear. 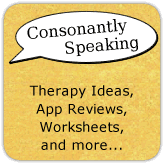 If you have selected the Audio Instructions to be on, you will also hear a male child’s voice stating “make a sentence about the picture”, otherwise if they are off, you will not hear any audio. 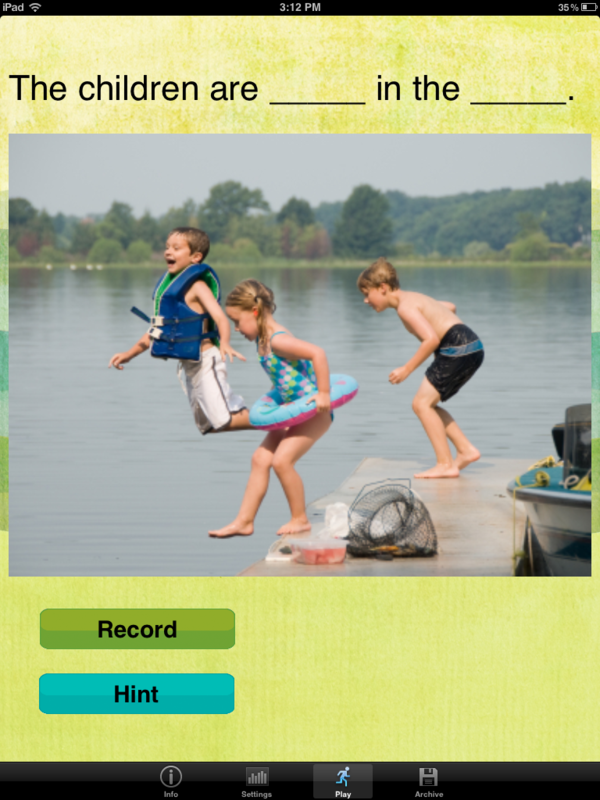 You can have the student “Record” their sentence related to the picture by pressing the “Record” button. Press the “Stop” button once the student has stated his or her sentence. If you would like the student to have a hint sentence example, and you have the “Show Hint Button” on in the Settings tab, you can press the “Hint” button. Depending on which level you have selected, you will either see text or hear an audio hint. If a Level 1 hint was chosen, a text example of a sentence will appear at the top of the screen with a few missing words for the student to fill in. If a Level 2 hint was chosen on the Settings menu, a few-word text example of the beginning of a sentence will appear at the top of the screen. Level 3 is different, where an audio clip will be played with no text indicating key words the student may want to include. 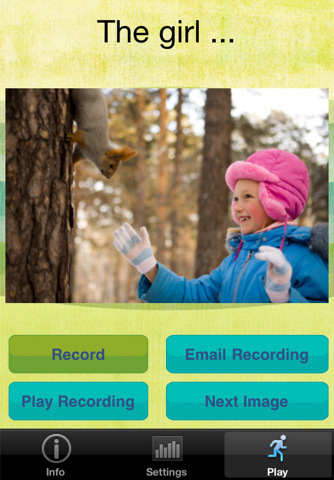 Once you have recorded the sentence, click “Play Recording” to hear the students’ recorded sentence. After you have played the sentence, you have the choice to re-record the sentence for a better sample by pressing the “Record” button again or to save the recording to the Archive by pressing the “Save Recording” button. Finally, select “Next Image” to go to the following image for more practice images. In addition, if the image and the hints are still not enough to help your student state a sentence about a specific image, select the “Skip Picture” button to go to the next image. Any sentence that you have previously saved for a user will appear in the Archive tab of the application. When you are in a specific students’ profile, the sentences saved for that student will appear in the Archive tab. To hear a saved sentence, select the sentence you wish to hear by clicking on an image/name underneath “Saved Sentences”. Once you click on a sentence button, you will see the large image associated with the sentence on the left hand side of the screen. This way, you will be able to know if that is the sentence you want to listen to. Click the “Play Saved Sentence” button to hear the entire sentence. If you want to delete the sentence from the archive, select “Delete Sentence” underneath the photo or swipe your finger to the left over the sentences’ button and press the red “Delete” button. You can delete all sentences for a user by selecting the “Delete All Sentences” button. The application will prompt you asking if you are sure you want to delete a sentence, just in case you pressed the “Delete Sentence” button by accident. Click “Yes” to delete it or “Cancel” to keep it. You can e-mail the selected sentence by clicking the “Share Sentence” button. When you press the “Share Sentence” button, the Mail application will pop up. You can enter who you wish to send the file to and it will be attached as a Quicktime file. Once you have completed all of the information needed to send the file over e-mail, click “Send”. If you selected “Share Sentence” by accident or change your mind about e-mailing it, you can click the gray “Cancel” button to return to the Language Builder application. Select whether you would like to save the e-mail as a draft to work on later or to delete the draft. E-mailing a sentence on the iPod/iPhone version of the application is different because there is no option to save a sentence to an Archive. Therefore, in order to send the audio file via e-mail, you must send the sentence you just recorded while still in Play mode. You have the option to e-mail the sentence once you have pressed “Play Recording”. Select the “Email Recording” button prior to clicking the “Next Image” button or navigating anywhere else on the iPod. The e-mail form will pop up just like in the iPad version with the same options. Like the iPad version, it will be sent as a Quicktime file. I love the fact that students can record their own sentences. The different levels of hints assist my students in sentence production. This way I can use the app with more than one student. Being able to save sentences to assess my students’ progress over time is a great asset; especially to show parents at an IEP meeting. I would like to see the iPod Touch/iPhone version of this application updated similar to the iPad version in regards to data collection. What I mean by this is currently, the iPod Touch/iPhone version does not allow for multiple students to store their data or track data over multiple sessions. What I would like to see on both applications is the ability to work with more than one student at a time. It would be great if students could take turns creating sentences as I often have groups of 2 or more students at a time. Sentence Expansion – This application itself is all about building sentences. However, one can keep expanding sentences by encouraging students to add more detail about the picture. You can encourage students to add a preposition, adverb, or adjective to the sentence to expand it even further. Inference/Prediction – Ask your student what he or she thinks will happen next after what is happening in the picture. Problem Solving/Social Situation – Some of the photos show the characters in the middle of a problematic situation/conflict. Ask your students what they would do if this happened to them. Narrative – Have the student think of a time when he or she performed or saw someone/an animal perform the action in the picture. Did he or she enjoy it? What else happened? The student can create a whole story about the picture. Articulation – Have the student listen back to his or her recorded sentence to hear whether or not he or she correctly produced all of the sounds. Language Builder is currently available for $5.99 for the iPod Touch/iPhone and $9.99 for the iPad. You can purchase additional modules through in-app purchases.